A new state-funded program has ensured nearly every public school district is equipped with a security tool parents support: metal detectors. After two rounds of orders, 410 school entities have requested 3,434 of the handheld devices, which were offered at no cost to schools. Schools could request one detector per 250 students. The use of metal detectors in schools is rare nationwide, yet a 2018 Phi Delta Kappa poll on public education showed 74 percent of parents support placing the equipment at school entrances. The National Center for Education Statistics reports only about 2 percent of public schools required students to pass through metal detectors daily in 2015-16, up from about 1 percent in 1999-2000. Random metal detector checks are slightly more common, with 4.5 percent of schools conducting them in 2015-16. In 1999-2000, about 7 percent did, according to the national agency. Allen County school officials don't expect to use the equipment daily. Rather, metal detectors are “another tool we have to conduct reasonable-suspicion searches,” said John Miller, chief operations officer for Northwest Allen County Schools. Dottie Davis, security director for Fort Wayne Community Schools, agreed. Checking all students as they arrive at their school would create logistical challenges, especially for a district with nearly 30,000 students, Davis said. Along with delays, she said, the practice would create prime conditions for an active-shooter situation. This isn't a new issue for FWCS. As the 1999-2000 academic year approached, district officials said handheld metal detectors had been placed in high schools and middle schools. They would be available to administrators should the need arise, officials said. District leaders stressed the devices must be used by people with proper training. U.S. Rep. Susan Brooks, R-5th, a Homestead High School alumna, recently discussed the topic with Southwest Allen County Schools administrators while in town for her class reunion. Brooks is founder and co-chair of the Congressional School Safety Caucus. She raised concerns educators share: If a weapon is found on a student, what knowledge does the metal detector operator have to remove the item? “They've got to be trained in what to do after,” Brooks said. 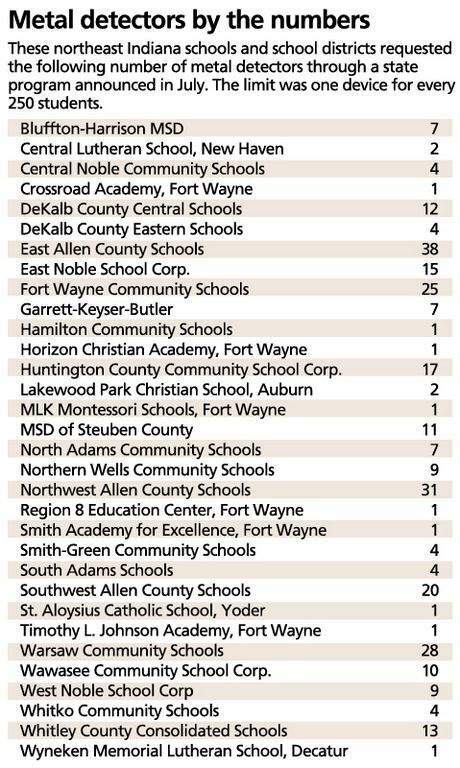 East Allen County Schools in August updated its policy to state only trained school personnel, law enforcement officers assigned to the district or school resource officers may operate the equipment under direction of the administration. Brooks is a fan of school resource officers because they are trained to use the wands, she said, but acknowledged every community cannot afford them. Costs associated with metal detectors add up. A 2011 research article reported the Cleveland public school system in 2007 estimated it would cost $3.7 million to equip 111 schools with walk-through metal detectors and X-ray scanners. The estimate included hiring 50 full-time armed security guards and 150 part-time security guards. The state metal detector program costs totaled $331,720 as of late September. The program is funded by the Indiana Department of Administration. It's unclear whether the money is supporting an effective school security measure. The metal detector study, which was published in the Journal of School Health, found there was insufficient data to determine whether metal detectors in schools reduced the risk of violent behavior among students. Some findings suggested the devices could negatively affect student perceptions of safety, the authors wrote. “The lack of a clear conclusion for this literature review raises the question of how school districts, worried about violence on a daily basis, should respond now,” the researchers wrote. Ultimately, Brooks said, the decision lies with school districts. Metal detectors are just another layer to school security, she said. “There is no one right answer as to how to keep a school safe and secure,” she said.